Our galaxy is filled with a number of strange and unique objects: hypergiant stars so large that it would take 70 quadrillion Earths to fill them, supermassive black holes that swallow entire star systems, a plethora of massive gas giants (hot-Jupiters) that can have orbital periods measured in hours, as opposed to days or years. And don’t forget the invisible unicorns (they’re everywhere). 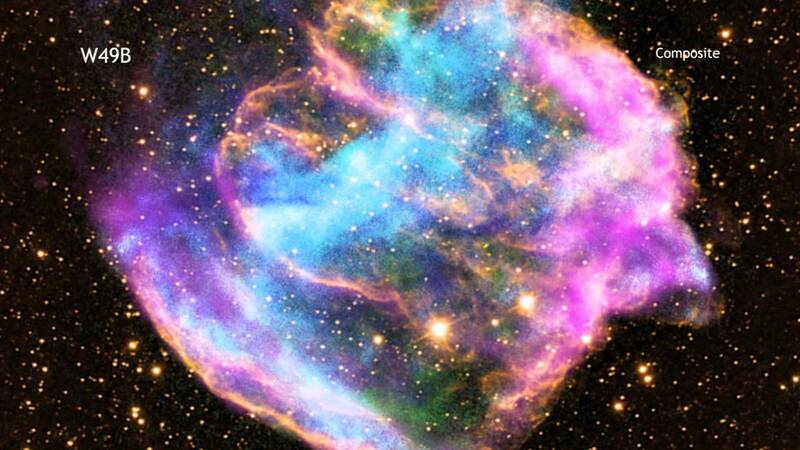 One of the most interesting on this list is W49B, a supernova remnant that is unlike anything we’ve discovered. The remnant is located some 26,000 light-years from Earth and is just over a thousand years old (which is extremely young in cosmological terms). In fact, W49B is believed to be the youngest black hole that has been discovered in the Milky Way. But this beautiful object isn’t unique simply because of its age. Ultimately, its shape is also extraordinarily rare. Typically, when a massive star runs out of fuel, it collapses. This collapse inevitably triggers a chain reaction, which culminates in a supernova explosion (an inferno that is equivalent to few octillion nuclear warheads, depending on the star’s mass). When a supernova occurs, the star’s outer layers are blasted into space at amazing speeds (typically a few thousand kilometers a second). This explosive blast is, for the most part, symmetrical–stellar material is ejected from the star at relatively the same speed and in all directions evenly. However, in the W49B supernova, the material near the poles of the doomed star was ejected at speeds much greater than the material at the equator. The jets shooting away from the star’s poles ultimately formed the supernova explosion and its aftermath, creating the remnant’s unique shape. However, there is some uncertainty over W49B’s current state of being. It should be noted that scientists are not 100% positive that there is a black hole at the center of W49B. However, there was no neutron star detected (the other object that is typically left behind after a supernova explosion). Since there is no neutron star, scientists have surmised that the W49B remnant surrounds a black hole. But further analysis is needed for confirmation. Either way, this is one of the youngest supernova explosion ever recorded (which is still a commendable title). And regardless of what scientists find at the heart of W49B, the discovery is promising. 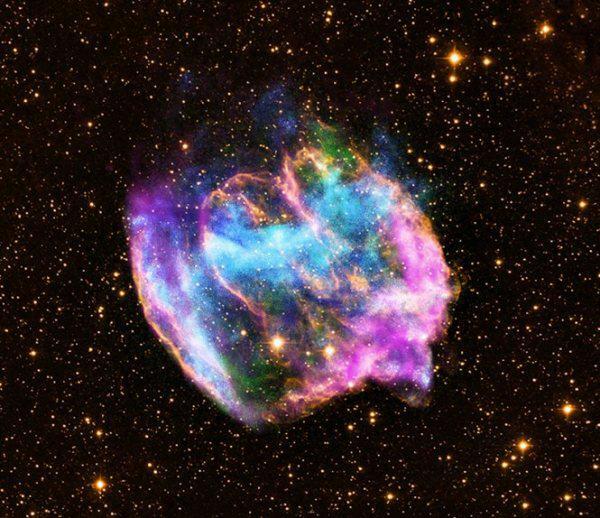 Supernova explosions are relatively rare. Scientists estimate that most galaxies average only five a century; however, we haven’t witnessed a supernova in the Milky Way for over four hundred years. As a result, there hasn’t been much opportunity to study this phenomenon (and that is likely a bit of an understatement). So W49B is extremely useful for detailed study. What else does the infrequency of supernova explosions in the Milky Way mean? Several months after the original findings, scientists announced that they had found Iron-60 – an isotope of iron that can ONLY be produced in the throes of death following the supernova of a massive star – in ancient fossilized bacteria found deep on the seabed flood. The fossils they found were left behind by something called magnetotactic bacteria. Bacterium of this type are known to align themselves “like a compass needle”with Earth’s magnetic field. Once they are situated on the seabed, they function by extracting fragments of iron from the water and surrounding minerals. They then release iron oxide crystals as a byproduct. Said crystals are preserved in the fossil records. This may sound unremarkable on the surface, but keep in mind that Earth is but one planet in a galaxy filled will hundreds of billions of planets. Yet one star, located thousands of light-years away (one light-year is 5.86 trillion miles/9.46 trillion kilometers), had a discernible effect on Earth more than a million (maybe even two million) years ago, which can still be seen and felt to this very day. Furthermore, we’ve seen similar traces of stellar events in the past. The most notable finding would include the carbon-14 spikes in the Japanese tree rings. Then, there is evidence that the red crucifix of 774 AD was linked to an exploding star. These events show that, contrary to the prevalent view of Earth, we don’t live on a planet closed off from the rest of the universe. Earth, as it turns out, isn’t immune to the dangers the stars pose. Similarly, it’s only right to ask whether or not these events play a role in the evolution of life on Earth. Our local star won’t go out with a bang, but with a whimper. Learn how the Sun, Earth and our entire solar system will die here. Or, read all about the star that flipped inside-out here.